Eating from the earth is good for our bodies – and for the planet. Here are some easy ways to fill your plate with more delicious, plant-based foods. What you eat affects how you feel every day. It also has one of the biggest influences on your longevity, vitality and your chances of developing a chronic disease. Nutrition experts have known how to eat for optimum health for generations, but too often the message is drowned out by fad diets, internet echo chambers and hyperbolic headlines. 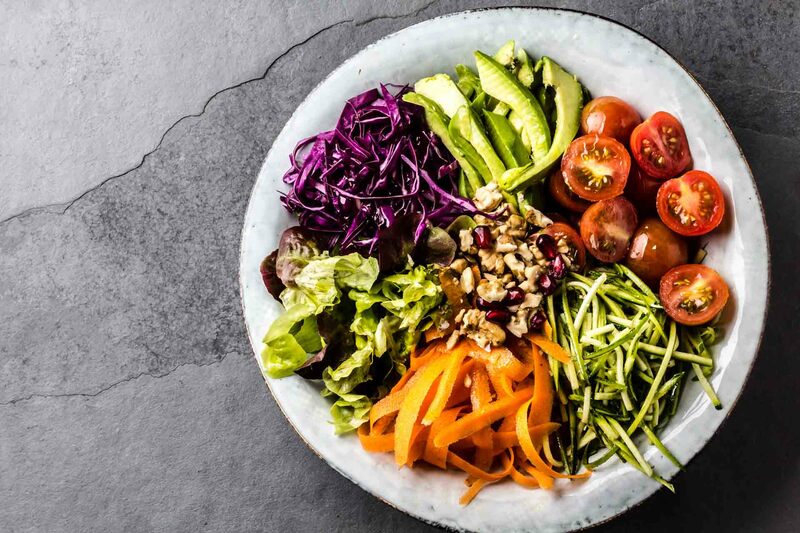 Eating more plant-based foods is the common theme among the Blue Zone diets – those diets around the world associated with good health and the longest lifespans. These diets were famously explored by National Geographic fellow Dan Buettner in his book The Blue Zones: Lessons for Living Longer From the People Who've Lived the Longest. Many studies (including the 20-year China–Cornell–Oxford Project led by Cornell University biochemist Thomas Colin Campbell) have supported the idea that eating lots of plant foods can contribute to a longer, healthier life compared to eating a meat-heavy diet. Plant-based foods include vegetables, fruit, nuts, seeds, legumes and wholegrains – anything that is a plant or that grows on a plant. Plant-based foods are also rich in important vitamins, minerals, fibre, antioxidants and phytonutrients, all of which are required for the body to function optimally. As well as being good for our bodies, eating more plants is good for the earth, Around the globe, the ever-increasing demand for meat is having a significant environmental impact. Legume, grain and vegetable crops have a much smaller ecological footprint than meat. This is not to suggest that everyone become vegetarian, but I do believe it's an issue more of us need to consider. Simply taking an approach that reduces your meat intake can help make a difference. The most common question I get asked about eating more plants and a smaller proportion of meat is whether you can get enough protein. Yes, you can! In fact, the Australian Bureau of Statistics National Nutrition Survey shows the average Australian eats roughly twice as much protein as needed. Any excess, just as it is with excess carbohydrates and fat, is converted to fat and stored. Including a good plant protein source in each main meal will keep your protein needs covered. Plant protein sources include dried beans, split peas, lentils, chickpeas, soy beans, tofu and other products made from soy, as well as nuts and seeds. There are also smaller amounts of protein in whole grains, and even fruit and vegetables contain a little protein. Legumes are among the most beneficial foods for human health and offer enormous environmental benefits as well. Luckily, there are plenty of delicious ways to enjoy them. Some, like butter beans, are quite creamy and therefore delicious in salads or pureed into mash. Adzuki beans are nutty and great in casseroles, kidney beans are meaty and robust enough for chilli, and brown lentils are great in everything from soups, burgers and salads, to tagines, stews and curries. Most hold their shape where others, like split peas and split red lentils, ‘melt’ and slip silently into sauces, soups and casseroles. Legumes can even be used as a flour replacement in sweet baking. I make a delicious apple cake with tinned chickpeas, and an awesome black bean brownie. Add a tin of chickpeas to your favourite curry or soup. Toss a tin of lentils, four-bean mix or chickpeas into your salad to make it more filling. Throw a veggie burger (that could include lentils, beans or chickpeas) on the barbecue. Use brown lentils in place of mince in a Bolognese or chilli, or swap out half of the mince and replace with lentils. Try scheduling a couple of plant-based days into your week. This sample menu shows how easy it is to get plenty of protein throughout the day. Breakfast – ½ cup oats cooked into porridge with 10 raisins, 5 walnuts, cinnamon and ⅔ cup soy milk. Lunch – Pumpkin, leek and red lentil soup, plus 1 slice wholegrain bread with avocado. Dinner – Lentil Bolognese with wholemeal pasta and 1 tablespoon parmesan cheese. Dessert – Baked apples with seedy nut topping and 3 tablespoons natural yoghurt. Snacks – 30 g cashews, 1 banana, 1 small soy latte and 30 g dark chocolate. Caroline Trickey is an Accredited Practising Dietitian working in private practice, who runs cooking classes in Sydney’s inner west.